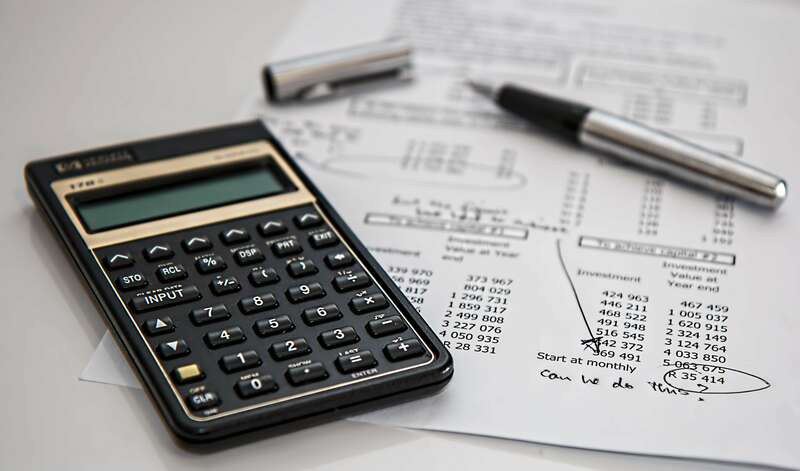 In this article, we will discuss to formulate a service automation business case and which financial figures you need in order to calculate the financial benefit of a Service Automation implementation or improvement project. This service automation business case template can be applied to all sizes and types of organizations including profitable and unprofitable businesses, government agencies and not-for-profit organizations. Please note that the accompanying white paper focuses on the determining the Return on Investment (ROI) and is intended to help organizations to determine their financial business case. A complete business case will also include topics around project planning, benefits analysis and a risk assessment. Because these topics will be different for every organization, we have limited the scope of the Service Automation Business Case template to the financial Return on Investment. In this article, we will briefly discuss each step and provides some sample figures for calculation purposes. The full description is available for download in our downloads section. The first step in drafting a service automation business case is to determine the financial gains that are associated with the delivery of automated services. Based on the theory of the Service Automation Framework, there are five key business drivers that have financial benefits for the organization. 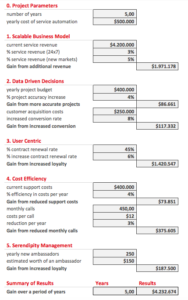 In the table below, these five key business drivers have been subdivided into measurable Key Performance Indicators (KPIs) that organizations can use. The last column shows data of a sample training company X that will be used in the next steps. The KPIs in the table above are recommended KPIs that every organization can easily obtain from their enterprise IT systems. The most difficult part is to estimate the improvement percentages of potential benefits realization. We therefore recommend to use industry averages as provided by IT research firms (such as Forrester or Gartner). The sample data in column 3 is for a training company X that wants to calculate the business case of automating their training services. The company currently has $4,2 million in revenue from this specific product line and aims to understand whether service automation could be beneficial for their organization. The second step of the service automation business case determines the financial gains over a period of time. This period of time is frequently set at 5 years. It is advisable to take a minimum of at least three years, because delivery of automated services will have a long-term impact on the organization. In the spreadsheet above, we calculate the individual gains that can be achieved through services automation. We first start to determine the period of time over the ROI needs to be calculated. This period of time is typically 3-5 years. In the example above, we have chosen a time period of 5 years. 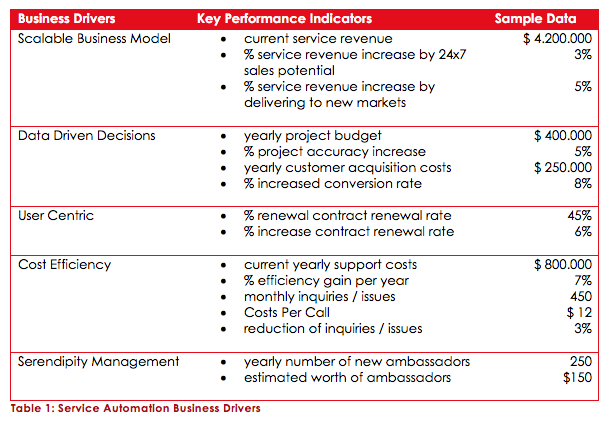 Next, we calculate the individual gains that can be achieved through service automation for each of the five core business drivers. Keep in mind that the ‘financial gain’ is determined by the difference between the situation in which a company would use service automation minus the benefits or costs in the current situation. For each business driver, we therefore only calculate the potential difference (or delta) of the use of service automation. Each of the benefits is subsequently calculated over a period of time (in this case 5 years) and summarized in the end result. In the example above, the expected benefit of service automation would be US$ 4.232.764 over a period of 5 years. The main challenge with composing a good business case is to adequately forecast and determine the potential gains. However, this is a common challenge with composing any business case, and not only for service automation business case. 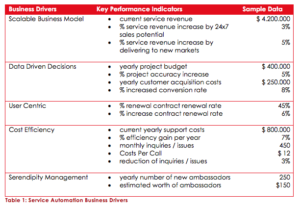 We found that breaking down the financial gains into the five business drivers and into the associated variables (as shown in Table 1) greatly helps to facilitate the discussion. In almost every organization, the variables of Table 1 are present. Additional guidance on industry metrics can be obtained from IT research firms such as Forrester and Gartner. Please note that the service automation business case Excel spreadsheet for making the calculations above is available to download for free on as a separate template. For every organization, the cost structure of moving towards service automation will be different. By covering the cost categories above, it is possible to forecast an adequate estimate of the costs that will be incurred. In order to make an adequate ROI calculation, it is necessary to determine the expected costs per year. One-time costs (for example the initial set-up and configuration costs) therefore need to be divided over multiple years for equal comparison. In the example of this case study, the costs of the service automation project are estimated at US$ 500.000 per year. 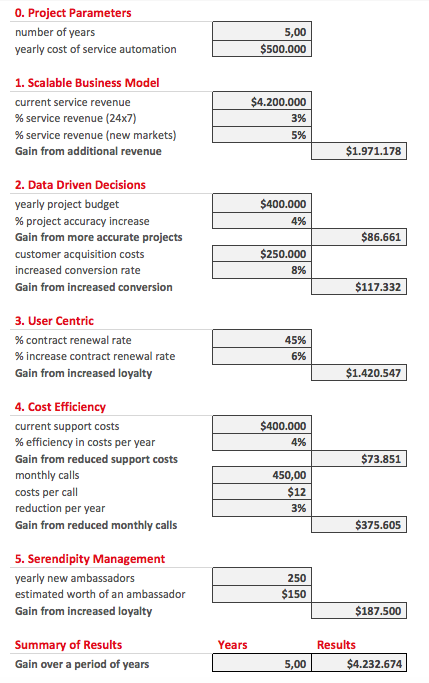 The final step of the service automation business case is to determine the actual return on investment. Now that the financial gains are known (as discussed in step 2) and the costs of service automation have been calculated (as discussed in step 3), we need to apply the formula for calculating the return on investment. In the example of our case study of training company X, the ROI will be 69% over a period of five years. Generally, this would be considered a strong business case to start the service automation project or imitative in the organization. Please note that for the sake of simplicity, we have not included the cost of capital (interest rate) in this calculation. If the service automation business case needs to be financed with external capital, it would be advisable to include this variable as well. However, since most service automation projects are done internally, in most cases this would not be required.